Polling day for the European and local elections is only a week away! We’ve got two massive campaign days we really need your help with as well as our big Red Tie Dinner to let you know about. All the details below. This Sunday 18th May we’re headed to Leamington for a “Super Sunday” session of doorknocking ahead of the European elections next week. We will be joining the local Warwick and Leamington Labour Party, starting in the morning (exact time TBC), and lunch will be provided before heading out again in the afternoon. A week Thursday 22nd May is polling day and we’ll be heading to Coventry in the afternoon to help maximise the Labour vote. We will be joining the St Michael’s Labour Party on what’s arguably the most important day of the campaign. We’re very excited to be able to announce the details for our annual Red Tie Dinner! This is the highlight of our social calendar; a formal dinner with a dress code of black tie + splashes of red. 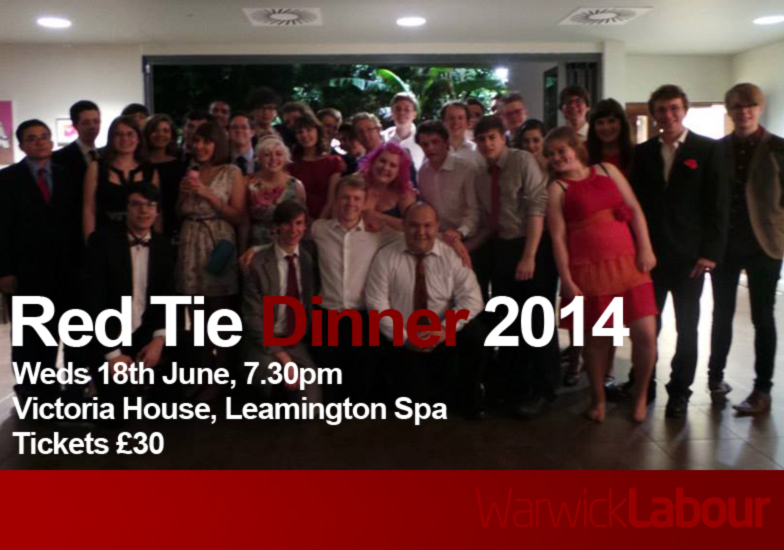 This year the highlight of our social calendar will be taking place at Victoria House in Leamington Spa. We will be having a smashing three course meal (wine included) followed by an award ceremony. After dining we will be retiring from the classy surroundings of Victoria House to the fine establishment that is Kelseys. We’ve also got a Facebook event set up to keep you updated. We hope to see as many of you as possible there!